Paul Mielke is superintendent of the Hamilton School District in Sussex, Wisconsin. He is an adjunct faculty member at Cardinal Stritch University in Milwaukee, where he teaches courses in teacher evaluation and organizational learning. He began his career in education in 1999 teaching English and coaching football at Wittenberg-Birnamwood High School. He served three years as an assistant principal/athletic director at Waukesha South High, another five years as principal at West Allis Central High School, and two more years as a principal at Templeton Middle School. Mielke received a bachelor's degree with a major in English and Secondary Education from the University of Wisconsin, Oshkosh; a master's degree in educational leadership; and a doctorate in leadership for the advancement of learning and service from Cardinal Stritch University. 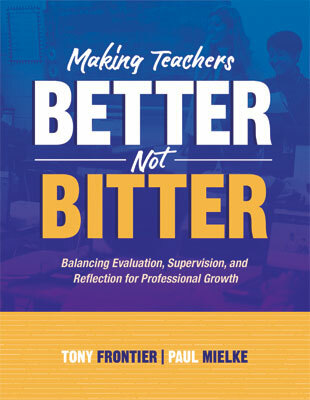 Tony Frontier and Paul Mielke combine the conceptual and practical by offering a compelling vision of teacher growth and dozens of step-by-step protocols for working with teachers.